This family run hotel enjoys an excellent location being equidistant from Glasgow and Edinburgh and one mile from junction 4 on the M8. 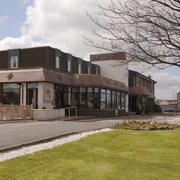 The hotel offers a ultra modern bar & restaurant, well appointed modern bedroom facilities and friendly attentive service. Explore Edinburgh, Glasgow or the central belt. McCarthur Glen shopping outlet is also nearby. The hotel is completely non smoking and offers Free wifi through out. If you love golf, you'll welcome the flexibility and convenience of our golf breaks. With one night breaks including a round of golf or Sunday Drivers including 2 rounds of golf available you're sure to find the right break at the right price.